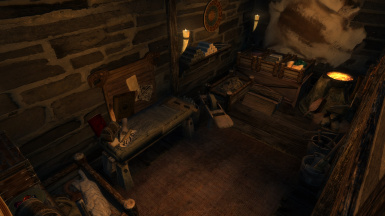 A small to medium sized Player Home located in a small Valley in the Mountains close to the Border between Skyrim and Morrowind; to the East of Windhelm. 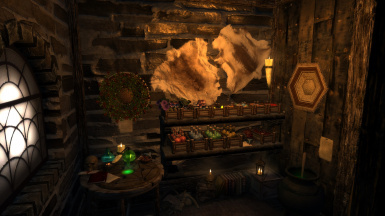 Almost complete Crafting Kit; only missing the Staff Enchanter and the Spider Experiment Kit from the Dragonborn DLC. Requirements: All Official DLCs. Since this File is not using any custom ressources in any Form or Shape I can't say much apart from two things. Do with the File what you want; as Long as it goes along with the Rules and Regulations of Skyrim Modding; Bethesda Ressources and the Nexus. - Moved the Tree between House and Outhouse downwards into the Ground a bit more - shouldn't be very visible for SFO users; and should avoid floating tree issues for those not using SFO. - Tweaked Nav-Mesh in the Entrance area further to avoid Followers getting stuck. Hopefully fixed that issue. Sorry for the inconvienience. 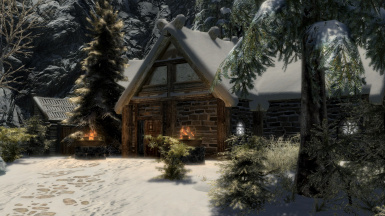 - Added 2 Small Stables to the Tamriel/Skyrim Side of the Entrance for your Horse. 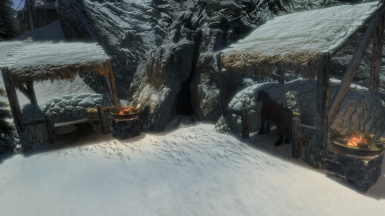 When Fast Travelling to the Entrance the Player Horse will be placed inside one of the Stables. - Added Fish Spawn Marker and Fishing Equipment / Caught Fish to the Pond. Now there are 4 lootable Salmon. As a sideeffect Art of Catch Users should be able to catch fish from the Pond now. 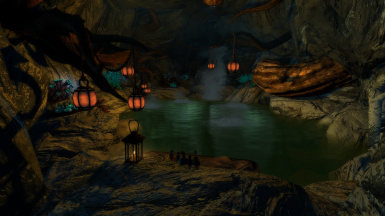 - Added a new Cell; acessable through the Valley; which contains an underground Hotsprings with 5 places to Sit. Mostly/Purely Roleplaying purposes. - Added an "Outhouse" in the Valley; mostly for roleplay purposes. - Fix'd a small Gap in the Interior of the House at the Stairway into the Basement. Added Water to the Basin in the Kitchen. Tweaked Nav-Mesh; now Mannequins should move less likely - I hope. - Removed Grass Landscape Texture. - Cluttered the "empty" Space with some replacements for the now gone Grass. 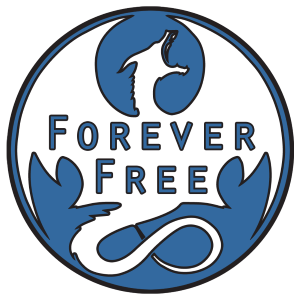 Initial Release of Fimbulvetr Retreat. These Requirements are most likely not changing any time soon. Why you might ask? Well; for one I think that at this point almost everybody has all DLC's (or the Legendary Version of Skyrim; considering all the Sales and whatnot that have taken place.). Another reason is that this Mod was created with the intent of only using "Bethesda" Files so to speak; there is not a single custom mesh or texture in use; so I didn't want to limit myself further by only using certain or no dlc content. Yes, that does mean that whatever mesh/texture replacers you have installed will heavily influence the Look of the House. 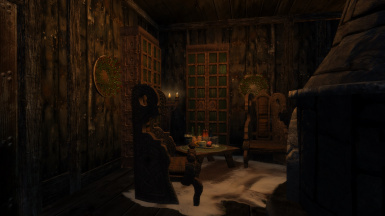 Apart from that those DLC's provide some really cool Furniture and other decorations and since I mostly created this Mod for personal Use I just wanted them. Now; I could remove everything coming from DLC's but that would make almost everything fall apart so to speak. The Interior would be much less cluttered; the exterior wouldn't have a Roof; and some decorational features aswell as some other parts wouldn't function any longer. 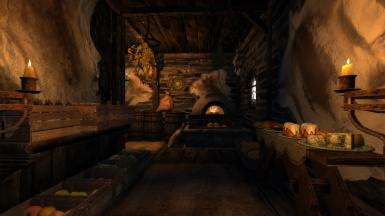 So sadly those Requirements stand and won't change; but there are so many other amazing Player Home Mods; I'm sure you can find one that suits you. Concerning Loadorder; well honestly it shouldn't be influenced or influence much [apart from things that Edit Tamriel Worldspace Cell 42, 8]. So I would say let LOOT decide. 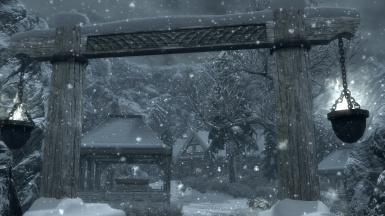 If you would force me to pick a spot that would be suited I would suggest to load after anything that "could" overwrite the Tamriel Worldspace Edit I had to make for the Valley to connect to Skyrim. 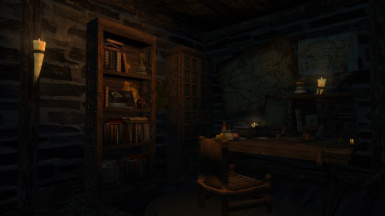 Unless you want that to be overwritten; which would be a bit strange since that would get rid of the Entrance to the Valley and disconnect this Mod from Skyrim. So I would say up to you. The People using older versions should be able to simply Update to the most recent by overwritting the ESP and keeping the Load Order Position where it was. If you want to be extra careful retrieve your Items; leave both the House and Valley; save. Update. Reload; reorganize your Items. Shouldn't be necessary; at least it was not during my own testing. But for good practice as a mod user *cough .. I always do that... promised*: Keep a Backup of a pre-update Save Game aswell as the pre-update esp; to fix issues should any come up. A small Valley located to the East of Windhelm. Inside the Valley there are two small Farm-ish Shelters; one with a bit of crops and a Grain Mill; the other providing shelter for a Cow and a few chickens. You will find a small House in the Valley aswell; which is the Player Home. 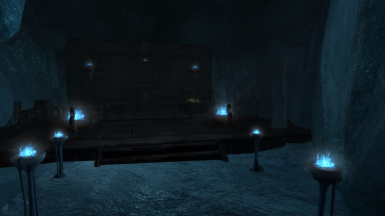 Underneath the Valley; accessable both from inside the House aswell as the Exterior; is a small Ice Cavern; furnished to provide basic comfort and shelter for a Vampiric Character. Since both entrances to this Cave are rather well hidden you can simply ignore those if your character isn't into Vampirism as there is nothing down there that you won't find upstairs aswell. There is a lot of Storage available; all named in a way I tend to store my Items if I have enough containers to do so. 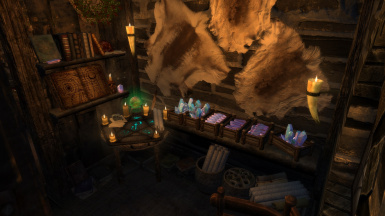 Most Storage is decorated with static Items reflecting the contents that the Name would suggest aswell as almost for all crafting areas a generically named "crate" or "miscellaneous" is provided for those that don't want to sort their Loot. While you can store your own goods in there they will be gone with the respawn. So I would not recommend using those as Storage. And besides; who places their valuable items among the Potatoes and Bakery? Anyway. You have been warned; I won't refund Items that have been taken by those Containers above.. or something like that. Three Mannequins; Four Large Display Cases; Three Dagger Display Cases; Four Weapon Plagues. Lots and lots of other Storage. A Shrine of Auriel in the Study; A Shrine of Nocturnal in the Bedroom. 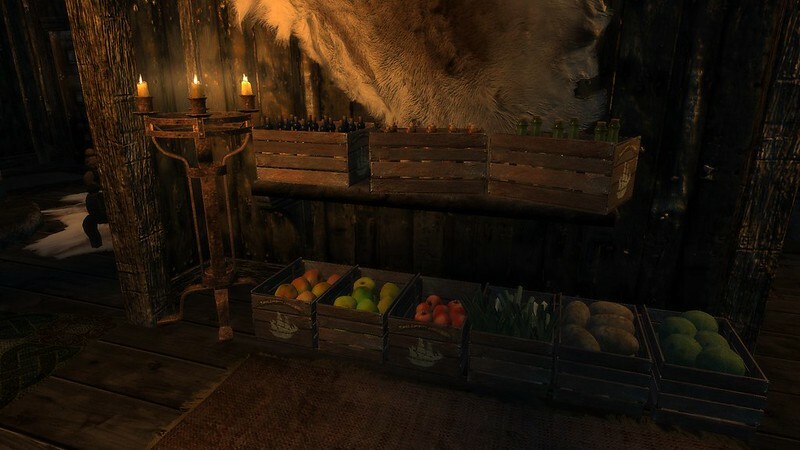 A Shrine of Tal... Get out Thalmor!.. 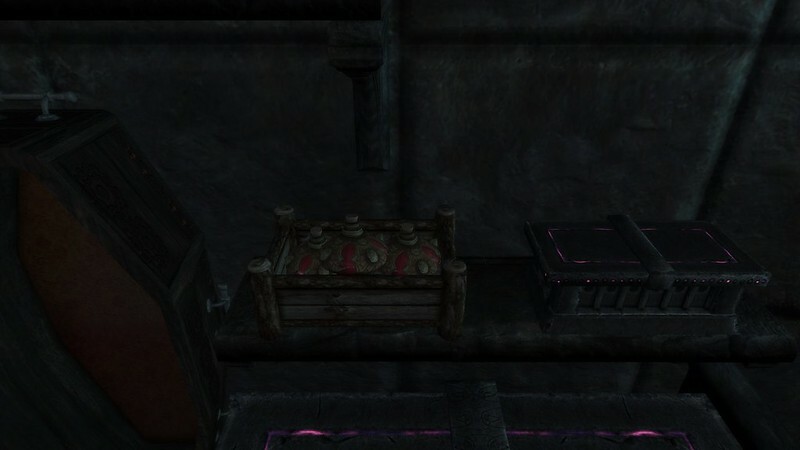 A Shrine of Talos in the Cellar. For the Vampires there is a Copy of the Bloodstone Chalice to be found down in the Cavern. While it works exactly like the original granting the buff for Vampiric Drain; which should work with the Misc quest from the Vampire Side of Dawnguard; it has a slight side-effect aswell. 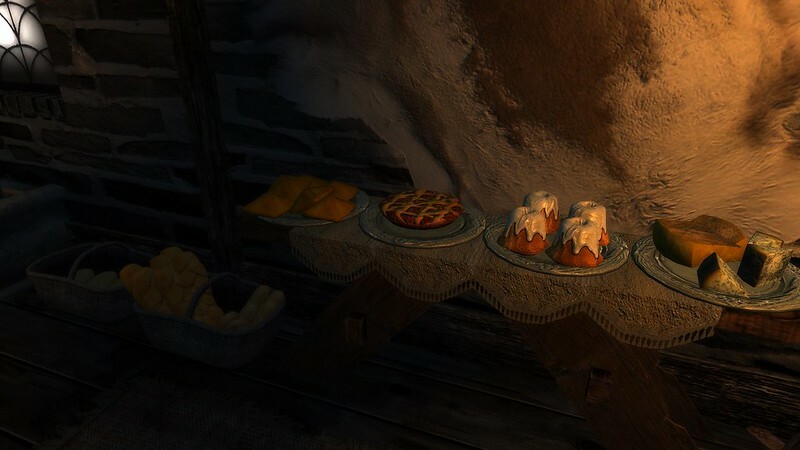 Upon Activation it will grant the equivalent of one feeding; in the form of a single application of the Feeding effect of those Blood Potions from the Dawnguard DLC. 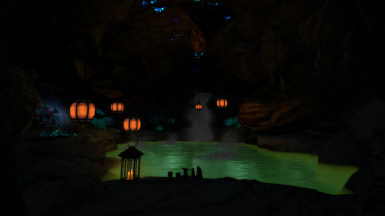 A small; cozy Underground Hotspring - as with many features mostly for roleplaying and/or screenshots. In the Mountains to the East of Windhelm. From the Stables of Windhelm; follow the Road east towards Brandy-Mug Farm and leave it behind; onwards past Hlaalu Farm and Hollyfrost Farm; past Traitor's Post. When you reach Refugee's Rest (the crumbling snowcovered Tower) you are almost there - turn south-east away from the Road; on the Rockwall in front of you should be a Cave Entrance - thats what you are looking for. After your first Visit this Cave Entrance will have a Map-Marker which can be used for Fast Travel Purposes. [Possible Issue / reworked] Art of the Catch will to my knowledge not work with the small pond in the Worldspace due to lack of fish(spawn-points) in those Waters. I might add some there eventually if/when I rework the Worldspace to bring back Grass. Edit: Pond now contains several Fishspawn Markers; which means Art of the Catch should function with the Pond. 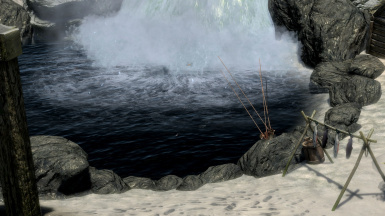 [Possible Issue] iNeed users might Need to climb the wet rocks Close to the Waterfall to around half to 2/3 up to refill empty waterskins directly or use the snowdrift Close to the Cow/Chicken Pen Door to get snow - another Option would be to craft a Water Barrel and place it somewhere where you feel it would fit. Not sure if this is caused by the Water I used for the small Pond or due to a conflict in my own Modsetup. Will look into it more if/when I rework the Worldspace to bring back Grass. 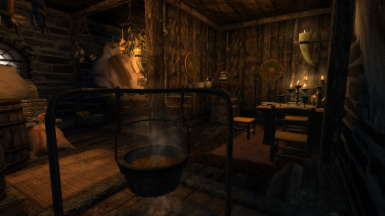 [not "gamebreaking"] Depending on the ENB Preset you are using the Interior of the House might be too dark. There is not much I can do about that; with all the ENB Presets available. Or for that matter for any specific; as my Computer is slowly mutating towards a electrified Potato - ENB and I won't go together well. 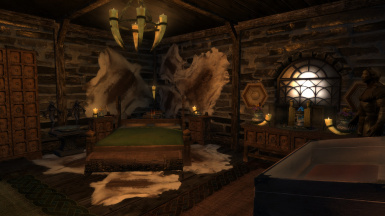 So I have to design it for me and hope that it works out with different ENB Presets. [Possible Conflicts] Anything that Edits the Cell [42, 8] in the Tamriel Worldspace. Apart from that I'm not aware of any Issues as of now; so if you spot some I would be thankful for as much insight as possible to resolve the issue in a timely fashion. - All the amazing People here on the Nexus; both the Staff aswell as the Members for providing such a colorful Community; a well organized Website and a huge amount of fantastic quality Mods. - My Friends for answering countless Questions; hinting at Issues during Testing and taking some amazing Screenshots of the little Project for me. Thank you very much! - Other Mod Authors on the Nexus; while I did not use any Ressources for this Project their work was highly Inspirational to look at both in my Game over the years aswell as in the Screenshots and Modpages of the Nexus. Thank you for sharing your mods with the Community. Since this Mod is a single .ESP File without any custom ressources used I think there is not much to be said. Use it in any way you want. If you have questions and think I might be able to help do ask. I would prefer it if this would stay a Nexus Exclusive; but with the previous said it is up to you what you do with it. Both of those Logos can be used as a clickable hotlink to their respective modpages. 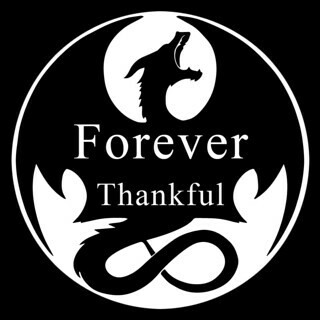 My thanks to both their creators!